Theft is everywhere these days: online and offline and our students are the most at risk. With school right around the corner, it's best to be proactive and protect your items before anything happens. Never leave anything unattended. Not even to step out for the bathroom, a quick phone call, nothing!! Take it with you if possible. If you have to leave it, lock it up. Laptop locks are awesome if you are working on something and need to step out for a second. Get the SSN's from your big ticket items- This is the first thing you're asked for in the event that electronics, bikes and other expensive items are stolen. They are typically engraved or labeled somewhere on the item. Take a few minutes and write them down in a safe place. Take photos of your items - These are also handy if they go missing. Put your name on it - Crooks tend to like things that aren't labeled. It's easier to pass off as theirs. There are some really nice ones you can order with a tracking # on it just in case they get lost. For more safety tips and information from Masterlock, check them out on Facebook here. 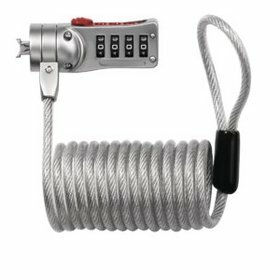 Disclosure: I am entering a contest for a Master Lock back-to-school prize pack as a member of the Mom Bloggers Club. This post serves as my entry.